PENETRON Specialty Products manufactures and sells high quality products for a wide range of flooring preparation, concrete repair and maintenance. From primers, self-leveling underlayments, vapor barriers to patching, skim coating and repair mortars Penetron Specialty Products offers reliable solutions backed by a customer satisfaction guarantee and technical support team. For renovations or new construction, the LEVELINE self level underlayments provide a level and flat surface prior to the installation of virtually any floor covering. Suitable for all residential, commercial and institutional applications in North Carolina or South Carolina. 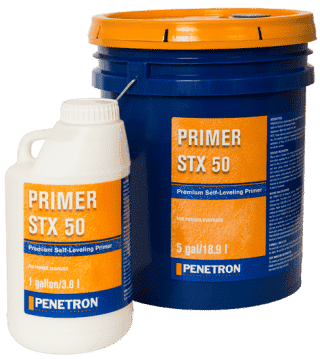 Penetron Specialty Products PRIMER STX primers promote the adhesion of LEVELINE underlayments and allow for longer working times resulting in a uniformly tenacious bond. 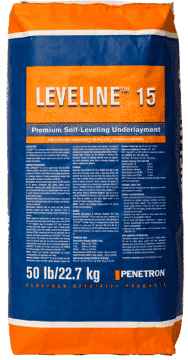 LEVELINE 15 is a premium, Calcium Aluminate, cement-based, interior, self-leveling underlayment. Its long working time, low shrinkage and superior leveling properties make it the ideal product for many demanding interior applications. May be used as a light duty wear surface with an appropriate sealer. 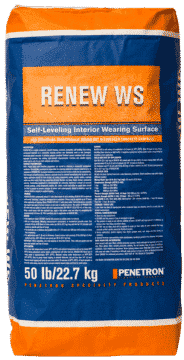 RENEW WS is a single component, smooth flowing, economic, pumpable, self-leveling, fast-setting overlayment intended as a restorative wearing surface over distressed, worn or rain-damaged, structurally sound concrete. It contains polymer modified Calcium Aluminate cement combined with mineral aggregate for fast-setting, high-strength characteristics. Available in gray, white and ultra white. Accepts stain and polish. 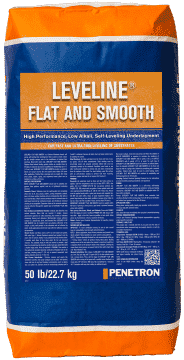 LEVELINE 45 is a calcium aluminate based, self-curing, self-leveling floor underlayment that is used to create a level, flat and durable surface prior to the installation of finished floor coverings. Mixed with water only, it can be installed from feather edge up to 1 ½” neat and up to 5” extended with aggregate. LEVELINE 45 provides a substrate which can accept ceramic tile and natural stone within 3-4 hours after application. Finished floor coverings such as carpet, VCT, vinyl sheet goods, rubber, epoxy, and engineered wood plank can be installed in as little as 24 hours. Designed to protect adhesives and floor materials by providing a flat and smooth PH barrier prior to installation. LEVELINE Flat and Smooth is a calcium aluminate cement-based, self curing, flooring underlayment that is used to create level, flat and durable surfaces prior to the installation of finished floor coverings. It provides for a suitable substrate that accepts porous flooring in 3-4 hours and non-porous in as little as 24 hours. 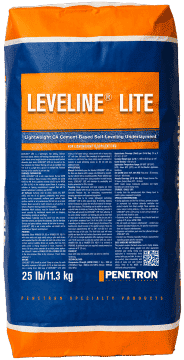 LEVELINE LITE is a lightweight, fast setting, calcium aluminate-based, self-leveling underlayment for interior applications where normal weight levelers or concrete exceed allowable dead loads. Suitable as the final substrate for finished flooring, it can be installed from 1/4” to 2” in a single lift or up to 6” in multiple lifts. Finished flooring can be installed in just a single day. PRIMER STX 50 is a polymer latex liquid used as a primer for self-leveling products. It is an aqueous dispersion of copolymer latex particles that improves the bond between a properly prepared concrete substrate and self-leveling underlayments. Ideal for all porous substrates: Easy application and quick drying; Water based, VOC compliant; 24-hour open time. 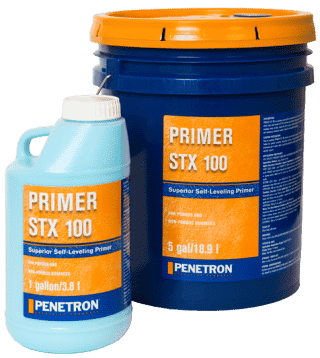 STX 100 PRIMER is a concentrated acrylic primer for use over various substrates including concrete, sheet vinyl, well bonded VCT/VAT, cutback and adhesive residue, gypsum underlayment, terrazzo, epoxy floor coatings, wood, ceramic and quarry tile. Its unique ability to bond to both porous and non-porous substrates makes it ideal for varying jobsite conditions. Very easy to use and creates an extremely tenacious bond and reduces surface porosity. Additional information on the best self level underlayment material systems and self leveling underlayment primer in North Carolina and South Carolina. Technical specifications for premium self level cement based underlay bag mix. Suitable for use on all interior residential, commercial, and institutional applications throughout North Carolina and South Carolina. Use as a bonding agent between multiple lifts of self-leveling underlayments. May be used as a sealer on porous substrates. Diluted 1:1 by volume with potable water for normally absorbent concrete. Ideal for barrel mixing or pumping applications. Can be installed from a tapered edge to 2” neat and up to 5” when extended with aggregate. Maintains healing and pour merging properties for up to 20 minutes. Self leveling underlayment for North Carolina and South Carolina. Fast return to service; walkable in just 1-2 hours. Accepts common floor coverings, installed with water based adhesive, in as little as 12 hours. Can be installed over 5-day-old Green concrete. High early strength – 3000 psi in just 4 hours. Will not contribute to the growth of mold or mildew. No dangerous emissions or irritating fumes. Environmentally friendly. Can or may add Leeds eligibility, see appropriate LEED contributions document. Lower alkali binder system creates an alkali barrier system from the underlying concrete when installed at ≥ 1/4” thick. This protects organic adhesives and coatings from alkali decomposition and secondary VOC emissions up to 90% Rh (water of convenience). 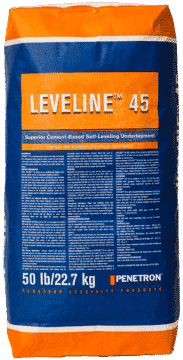 LEVELINE 45 self leveling underlayment is suitable for use on all residential, commercial, and institutional applications in North Carolina and South Carolina. Ideal for pumping and barrel mixing applications. Maintains healing properties for over 25 minutes. Water resistant and non-gypsum based. Contains no protein additives. Can be applied from featheredge to 5”. High early strength, walkable in just 3-4 hours. No dangerous emissions or irritating fumes. Lower alkali binder system creates an alkali barrier system from the underlying concrete when installed at ≥ 1/4” thick. This protects organic adhesives and coatings from alkali decomposition and secondary VOC emissions up to 90% Rh (water of convenience). LEVELINE FLAT AND SMOOTH self leveling underlayment is suitable for use on all residential, commercial, and institutional applications. Ideal for pumping and barrel-mixing applications. Maintains healing properties for over 25 minutes. Moisture resistant: Non-gypsum based. Contains no protein additives. Will not harbor or support mold or mildew. High early strength, walkable in just 3-4 hours. Available from Turning Point Innovations in Charlotte North Carolina. No dangerous emissions or irritating fumes. Protection from alkali attack: Unlike standard primarily Portland cement-based products, which can reflect a highly caustic alkali substrate that can break down adhesives and certain PVC floor coverings, LEVELINE FLAT AND SMOOTH’s calcium aluminate base creates a low alkali barrier that can provide protection of these adhesives and floor materials against attack and, ultimately, delamination from aggressive substrates. Improved indoor air quality: When adhesives break down due to alkali attack, toxic elements of the adhesive begin releasing gas. LEVELINE FLAT AND SMOOTH’s calcium aluminate base can prevent this breakdown and improve indoor air quality. Ideal for barrel mixing or pumping applications. Can be installed from 1/4“ to 2” neat and to 6” in multiple lifts. Maintains healing and pour merging properties for up to 20 minutes. Lightweight – cured density of less than 80 lb/cu ft and does not require any lightweight aggregate or fill. Can be used as the final substrate for finished flooring. Lightweight self leveling underlayment in North Carolina and South Carolina. Calcium Aluminate base allows for reduced shrinkage and rapid strength. No dangerous emissions or irritating fumes. Can contribute points to LEED certified projects. Is not gypsum-based and thus water resistant, preventing support of mold or mildew. Lower alkali binder system creates an alkali barrier system from the underlying concrete when installed at ≥3/16” thick. This protects organic adhesives and coatings from alkali decomposition and secondary VOC emissions up to 90% RH (water of convenience). visit www.penetronsp.com for LEED contributions document. Lower alkali binder system creates an alkali barrier system from the underlying concrete when installed at ≥1/4” (6 mm) thick. This protects organic adhesives and coatings from alkali decomposition and secondary VOC emissions up to 90%. Application temperature range: 50-95°F; NOTE: Above 85°F , use ACI Hot Weather Application Guidelines. Cure time @ 73°F: Accepts floor covering, polishing, resinous coating/toppings or light traffic in 24 hours.